Pathfinding with disappearing platforms - is it solvable? 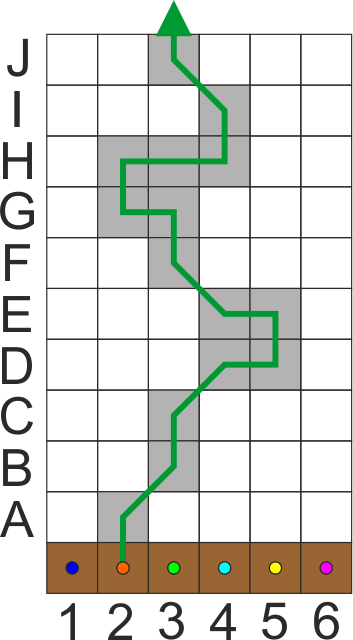 This is a puzzle but might not have a solution. So "is it possible?" is a proper question. 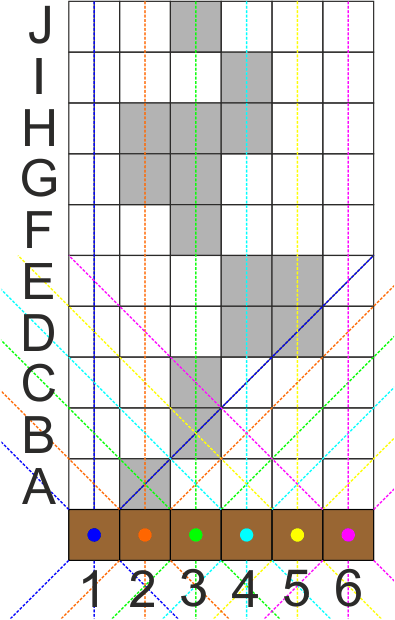 There is a grid of 6x10 rectangular stones of fields of which some contain 'magical' stones which are solid under specific circumstances (defined below, shown in grey) and 'vacuum' otherwise. The other fields are 'vacuum' all the time. 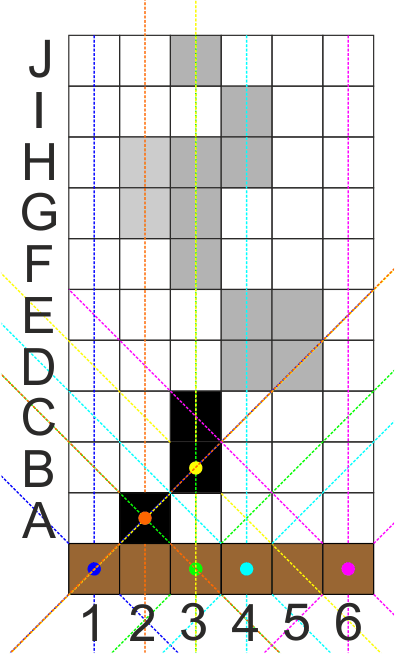 Now a stone becomes solid (black) if, and only if, at least two different rays cross over its centre, while rays of a player standing on the platform do not count. Note that 2 parallel rays are not considered crossing each other. Can you bring all players safely across the field (along the defined path)? Can you bring at least one player safely across the field (along the defined path)? 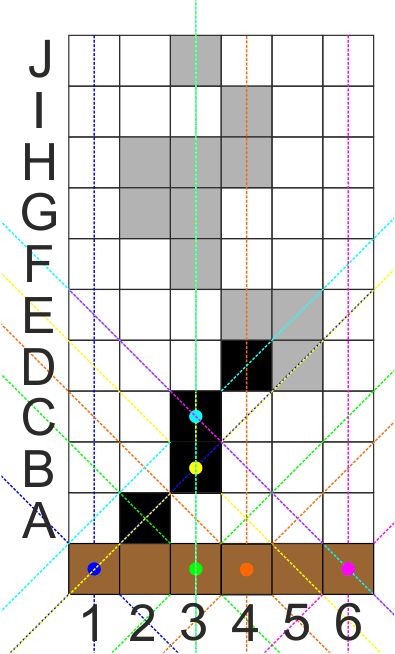 Notation: Assuming only one player moves at a time, you can note its colour and final position (assuming the path to that one is 'walkable'. See my example answer below. "Remove" a player and his colour and check which platforms are (still) solid. Add player-rays and check which additional platforms are solid. This is the new "next" starting position. Note down the move and restart from 1. Select a colour (click the big square to change colour) to "pick up" a player. Now check which 'path' is available and move the player to the end-position you want. (The tool does not allow going diagonal directly, but the rules allow it where indicated in the pre-given path.) To set-down a player, simply select another player/colour. 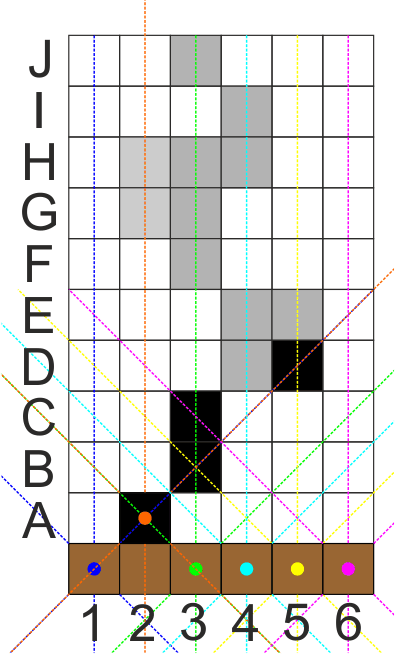 Using 'black' mean that all players are set-down. This isn't really an answer, but this is a program that I made that should allow you to better solve this puzzle (or create your own using the same premises). This is a very clunky program that I put together, but it should be fairly user-friendly and easy to work with. The little arrow things: In the bottom-right of the screen is a large red box with an arrow on each side. If you click on the red box, it should cycle through the colors (Red > Blue > Green > Yellow > Purple > Orange > Blank/None > Red). Use this to choose which player you intend to control. By clicking on the appropriate arrow button near the selection box, you can then move that character in the indicated direction on the map. Other: You may use the spacebar to place all of the players back in their starting positions. This does not reset the path to default, just the player positions. As I said, this is a rather clunky program. So there are a couple of known issues. First, the player dots are able to move off of the grid. I didn't feel the need to put in restrictions, as this is just a sandbox-style program. I hope this helps and my instructions make sense. 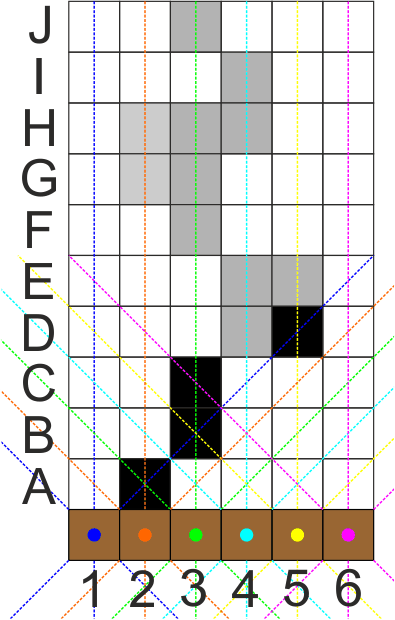 This is a partial answer only, demonstrating the first few (potential) steps. Each image depicts the situation after the named move. Remember during movement the rays of the moving player are off, so all platforms 'held' by his rays (and no other 2 crossing colours) will immediately disappear! Not the answer you're looking for? Browse other questions tagged logical-deduction puzzle-creation visual reachability or ask your own question.